Finding sensational fall activities for kids is as simple as looking around outside. 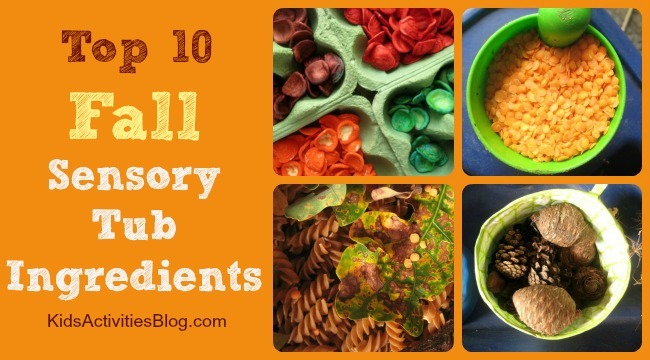 Kids Activities Blog loves this sensory tub ingredient list as a great way to introduce sensory awareness when choosing fall activities for kids. Creating a sensory tub is a wonderful way for children to play, giving them so many different colors and textures to explore and lots of open-ended materials to use, however their imaginations suggest. And don’t you think autumn brings the very best combination of natural materials and color-theme to use? 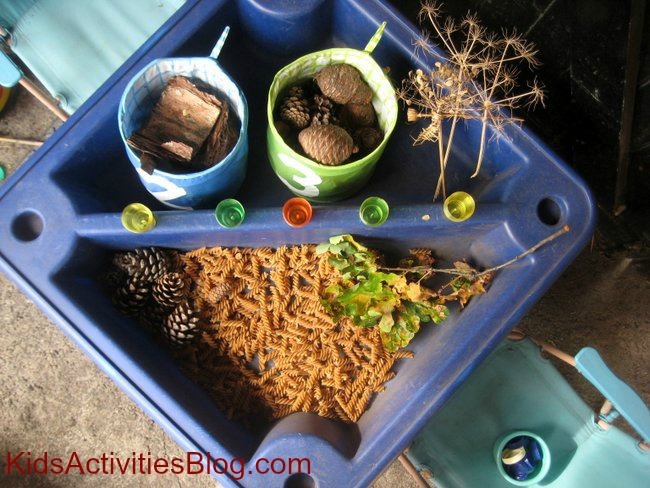 A fall sensory tub is very easy to set up and can give your children hours and hours of play. The basic idea is to get a container that is large enough to hold a selection of materials, and then fill it with goodies for your kids to explore. We often use a plastic under-the-bed storage box for our indoor sensory tub, which is big enough to give the children room to play but also easy to fill, store and transport around our play space. For autumn, we’re setting up our sensory tub in the garden, under a covered porch. It’s just the invitation to play my children need to encourage them to keep heading outdoors into the fresh air, even as the temperatures get a little cooler. What do you put in your fall sensory tub? I like to offer a rich variety of sensory materials, so as many colours, shapes, and textures as I can find. I make sure there are lots of natural materials in there, often collected by the children from the garden or on one of our nature walks. 10. Your turn! What’s your favorite thing to include in a fall sensory tub? We just gathered bits of nature this morning. They would be great for a sensory tub. What a great idea. My groups will love this. I like to put rolled oats with cinnamon. It smells great. Add pine cones and other fall finds with spoons and cups. It’s great for little ones who tend to put things in their mouths. Its not very tasty but at least it’s not terrible if they do accidentally eat it. If they get tired of it just add a little water to make it more mold-able. What a fantastic idea Kelly K! I love your suggestion of adding some water to give the tub a new dimension Lauren.